A Year of Being Here: Dorothy Walters: "Don't Make Lists"
from your body's fresh soil. Don't make lists, or explore ancient accounts. "Don't Make Lists" by Dorothy Walters, from Marrow of Flame: Poems of the Spiritual Journey. © Hohm Press, 2000. 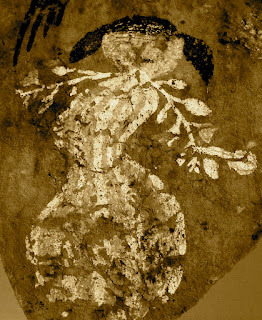 Photography credit: Anasazi plant deity from a wall painting in northern Arizona (c. 1200 B.C.E. to 1300 C.E. ), photographer unknown (originally color).